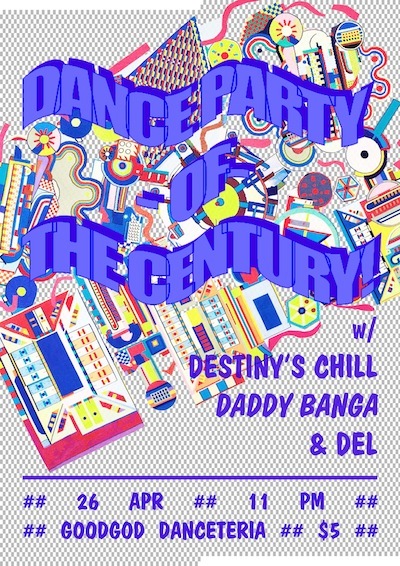 This Friday, DJs Destiny’s Chill (DancePit), Daddy Banga (Woofta) and Del (Vogue) take over the Danceteria for the first time and will play as if it’s the last dance party on earth! Dance Party of the Century is a night for homosapiens who are always thrilled to bust out on the dance floor. Expect old songs, new songs, popular songs, hip hop songs. We couldn’t wait until Friday night to hear what Del had in store, so we hit her up for an exclusive music video sampler of what to expect! Classic Rn’B sampled by musicians and producers over the years. Sometimes it just feels nice to jam to the original. A party starter that I never hear played at parties. If you like Queen Latifah, Salt N’ Peppa and/or Neneh Cherry this will fit well in your mix. Part of the new wave of queer rappers from New York reminding me that rap is very much alive, in style and unapologetic. Cakes is a lyrical deity, all hail! 90s teen pop at its best, anthemic and maybe reminiscent of the days when you would collect all of the lyric cards out of TV HITS magazine. A sparkly Italo disco gem from the 80s. Easily aligned with greats like Nu Shooz, Stacey Q and Madonna – in some parts it reminds me of Holy Balm. Dance Party of the Century is this Friday from 11pm. Just $5 on the door. See you there!